Whether you like them or not, smartwatches are here to stay and the current leader on the market for wearables is unsurprisingly none other than Samsung. According to a report by Strategy Analytics, the tech giant from the Far East had 71% of the market during the first quarter of the year, as it shipped 500,000 smartwatches during the trimester. But what's more interesting is that the manufacturer grasped the lion's share of the market by only selling the original Galaxy Gear smartwatch. The second generation of Samsung's wearables, the Gear 2 and the Gear 2 Neo, got unveiled back in February, but they didn't hit the shelves until April 11, which is in Q2. 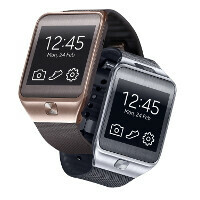 If we take into consideration that the Gear 2 and the Gear 2 Neo are arguably way better than the Galaxy Gear, we can presume that Samsung might ship even more units of its new wearable gadgets in the upcoming months. Strategy Analytics' report also reveals that the worldwide market for smartwatches scored a substantial 250% increase in Q1 2014 in comparison with the same period back in 2013. We would wager that with upcoming and anticipated smartwatches, such as the Moto 360, the LG G Watch, and the highly-rumored iWatch, this number might go even higher. What's more, it will be more than curious to see if Samsung will continue to be the major player on this relatively new market niche or its rivals will quickly diminish the company's dominant presence. Waiting for NOKIA *not MS* Smartwatch ..
Samsung has some great deals on for some of their smart watches right now. When you buy a Galaxy S5, some carriers will give you the option to buy a Gear Neo for $49 as well. Which is really worth that price for a smart watch like the Neo. In fact the Neo is a stand alone universal remote. Never mind all the other features that the Neo has. Not gonna happen.... Keep my words!!!! If it's real, then it will not carry the Nokia name. Smartphone alone is enough for me. Ships 500,000 Sells thirty a month. Once Moto 360 comes out, Samsung can kiss their McDonalds kids meal toy goodbye. I'm not sure that Moto 360 will affect that much on Gear sales, since most of Moto devices are not available worldwide. Still waiting for that secret warehouse where Samsung hides it's phones/smartwatches. Retailers must be really stupid to order these from the time of Galaxy S. They must do something really amazing to make billions of profit every Quarter while not selling anything. Are you really blind are just being ignorant. I worked in downtown Los Angeles and most of the people I've seen are using either Galaxys or iPhones. NYC Big Apple here, haven't seen a single one. Maybe youre the blind one mistaking Februarys kids meal toy of the month: Dora The Explorer and Boots Orange Edition. You haven't seen a single one! Such a shame.. Do you realize that it doesn't really matter whether you see or not? you only see miniature featureless iCr@ps. Ok normally I wouldnt respond to such a stupid post (seriously, are you that stupid?) Apple. Financial Problems? LMFAOOOOO The richest tech company im the world has enough money to support your next 100,000,000 generations of kids, grandkids, etc etc etc. man.. wow calm down. My reply was to the other post, not yours. I replied to rd_nest. make sure you check before commenting. why the hell would I say this about apple? Haters are being stupid. Gears 2 were sold out at Best Buy and AT&T online and in-store around 3 weeks ago. I just sold couple of Gear 2 eBay and Craiglist in the past weeks making around around $40 each. AT&T online offers 25% off. Most AT&T stores are still sold out. Go check yourself. Typical iGnorants. When there is only a limited inventory/quantity that available then is sold out, that doesn't say much. It's like saying Nexus 5 was sold out many times on Google's website, but that doesn't mean it is selling millions. Please use your brain before posting stupid comment. I am not sure if you're actually a stupid person or you tend to act stupidly. Gear 2, Neo, and the fit were sold out on their 2nd day in every store in the US, I had to wait 2 weeks to get my Gear Neo and I love it. Butthurt Apple fan detected ! He is a Sony fanboy actually, a very annoying one. Looks like you are the butthurt one, lmfao. As of now the $300 Gear 2 is still sold out at Best Buy online and in-sotres. Ebay Gear 2 Neo autions is still going at least $190. that's funny, you love lying.